This week I’m joining some of my best blogging friends for another Play Day series! As for me, we came back from Puerto Rico to over a foot of snow. When’s the last time that happened?! Something about a polar vortex, icemaggedon, snowpacalypse combination? What better way to embrace the snow than with a little homemade snow cream? 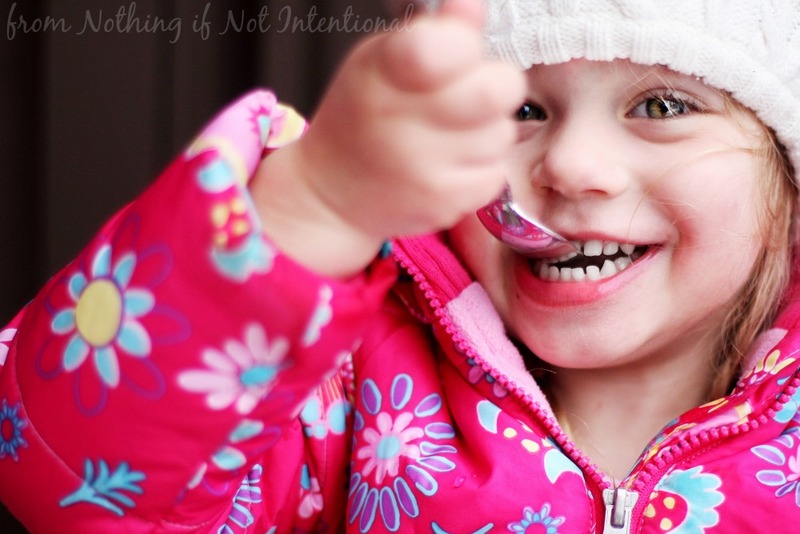 A quick glance through this post will show you that my girls definitely approved! This is a VERY forgiving recipe. Some recipes say “1 gallon” of fresh snow. Who actually measures one gallon of snow? Not me! I mixed the milk, sugar, and vanilla inside in a mixing bowl, and then I added the snow when we went outside. I mixed it together a bit, and we ate it immediately. I know some of you want exact measurements. Here’s the detail you need to keep in mind: you want twice as much milk as sugar. So, for example, I used 1/2 cup sugar and 1 cup of milk. I even let the “baby” join in on the taste tasting. To switch things up, I added a drop of mint to each of our bowls. Oh my word. AMAZING. 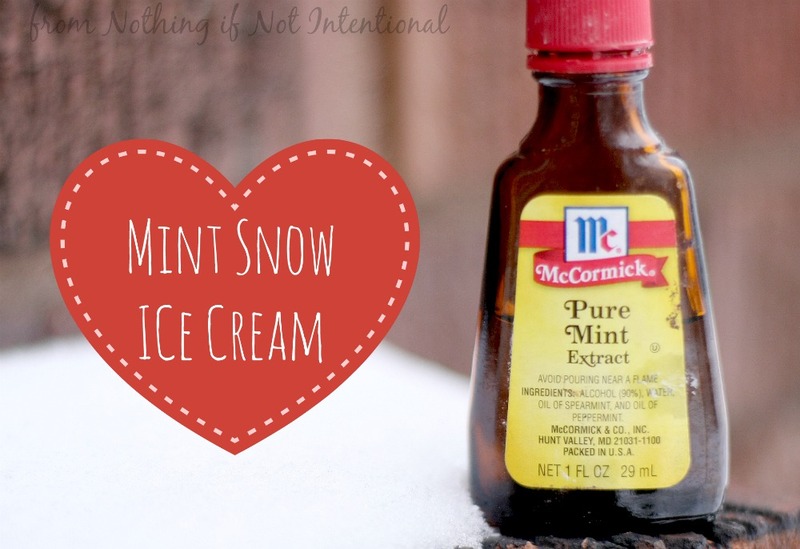 A word to the wise: use a small drop of mint. A little goes a long way. Chocolate syrup as a topping or substitute chocolate milk instead of white milk. We’ll be back Tuesday with another play idea–the next one is one of my favorite childhood memories, and I’m reallllly excited to share it with you. It would be a huge compliment if you’d subscribe to email updates (I promise not to spam you) or joined us on the Nothing if Not Intentional facebook page. Pingback: Cookie Cutter Snowman Art for Kids - Fun-A-Day! Pingback: So long, Snowman! Make a Snow Horse Instead! 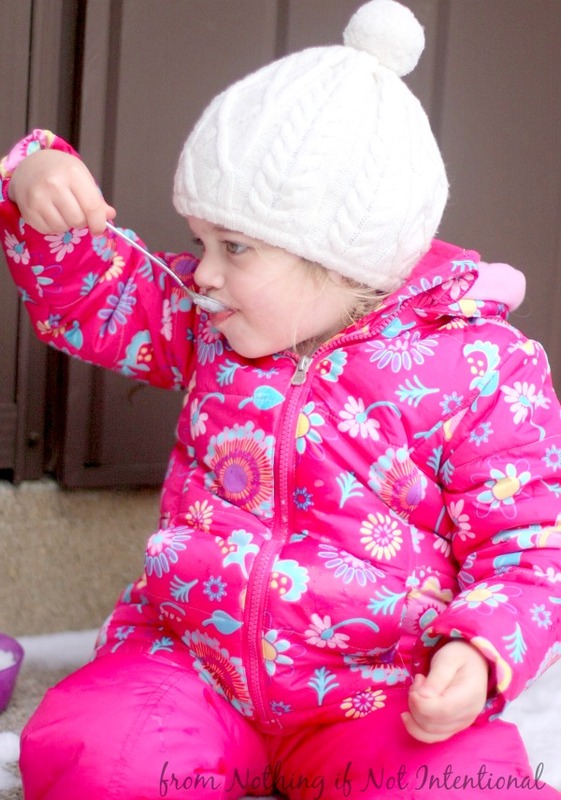 Pingback: Make the most of the cold with these simple and fun ice experiments. Pingback: Winter Round-Up! | This side of Mommyhood..